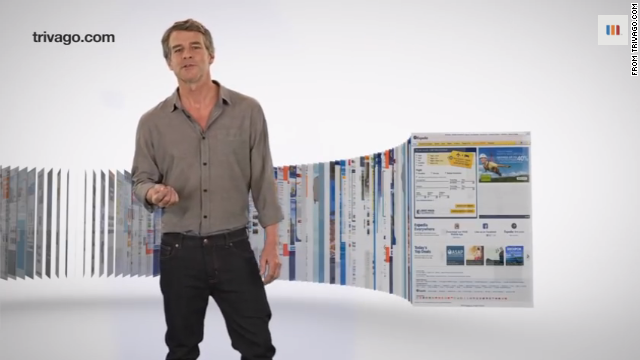 "Trivago Guy" Tim Williams used to look like this in his ads for the travel website. (CNN) -- Lookin' good, Trivago Guy. In a brief new commercial, Tim "Trivago Guy" Williams comes across as more polished than the disheveled pitchman he was a few months ago. His hair is nicely tousled, his slim-fit shirt hugs his torso, and he has a fashionable touch of facial stubble. OK, it's hard to tell whether he's wearing a belt, but that's because his shirt is untucked. The new look is a response to the complaints -- some wry, some serious -- the company got after an earlier series of ads featuring Williams. As one person on Twitter wrote, "I had no idea #trivagoGuy was a thing, but I do know that my wife and I both wondered why homeless people were doing travel ads." Some people even dressed up as him for Halloween, perhaps as a way to frighten children (or, more likely, Anna Wintour). Trivago wasn't going to let that slide. "Trivago was listening!" the company trumpeted in a news release. "Someone @ @trivago was listening - the #trivagoguy got a #makeover. Better fitting shirt in a flattering color. The scruff looks intentional," wrote The Quiet Car. ... though there was the matter of the beard. "Hey, the creepy #TrivagoGuy got a new shirt & a haircut! Still, would it kill him to shave? @TravelinAnn #travel," wrote JohnCinnamon. But don't push him to put on a belt. "I had a belt on at one point, and it just didn't kind of go with the outfit and we scrapped the belt," he told CNN in August. "It's probably one of the best decisions we ever came up with, because look what it's created." CNN's Marnie Hunter contributed to this story.